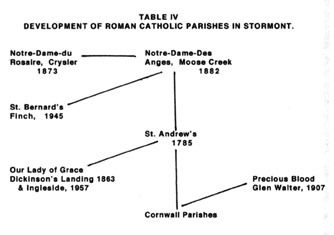 The following 3 charts, as shown in the book Stormont Dundas and Glengarry 1945-1978 by Clive and Frances Marin, Chapter 7, The Churches p. 269, 273, 278, show the Development of the Roman Catholic Parishes in Glengarry, Stormont County as well as in Cornwall. Each of the churches named, include a date of their beginning. Under Churches, mainly those of Glengarry County I have listed under a number of them, information regarding when these records begin for that church. St. Raphaels Church records are also on microfilm. All the Catholic Church records for the Diocese of Alexandria-Cornwall are on Microfilm and accessible, I believe up to about 1921 at the Alexandria-Cornwall Diocesen Centre, 300 Montreal Road, Cornwall, Ontario. Check out this web site for more information for the Diocese of Alexandria-Cornwall. At the Diocesen Centre, you will probably need to make an appointment, if you are visiting yourself, or contact someone in the area to help you out. 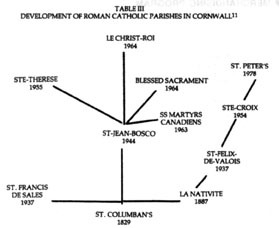 Thus depending where your ancestor lived, these 3 charts will give the viewer an idea of what church was in existence when that person lived. Thus making it easier to find the Mother Church to check those records. For some church records in book form see the following web pages. Area books on interlibray Loan. 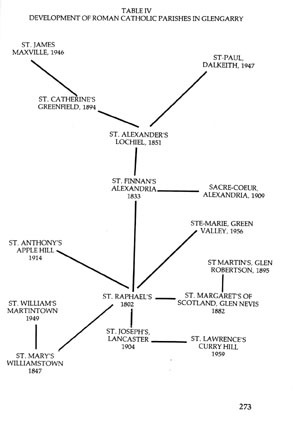 The Maps Page to better help where possible to locate the ancestor of the viewer, thus the possible church attended and the time period concerned.